A few months before Jake and I were engaged, a friend from work got married. Her very sweet husband bought her a cocktail ring with an orange stone as a wedding gift. They met at the University of Illinois (whose colors are orange and blue) and were married in October with bright, fall wedding colors, so this was a perfect gift. I came home going on and on about that beautiful ring. Jake must have been listening. He surprised me with a little something blue the day before our wedding. 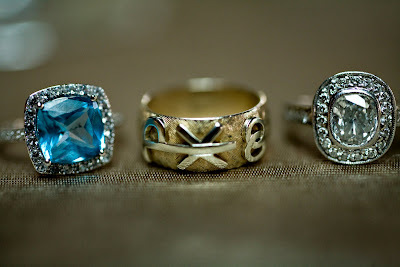 My blue ring, my Grammy's wedding band, and my engagement ring. He also bought me a very sweet and understated necklace with a quote from Goethe inscribed "Nothing is worth more than this day." Awwww... I felt so special wearing both the morning of the wedding. The necklace had a small, red stone and a silver, inscribed oval hanging from the delicate chain. Showing my rings to two of Jake's sisters. Jake is a big fan of the French cuff shirt and he has started to acquire a nice collection of cuff links. It seemed fitting that I buy him a special pair for the wedding day. I found a pair of locket cufflinks on Red Envelope and snapped them up during a sale. I put photos of us, his parents on their wedding day, our puppy and our new home inside. Jake had already decided to wear his father's wedding day cufflinks that morning, so, rather than chose between the two, he wore one of each. I love this photo because Jake looks so happy and excited for everything that is going on that day. 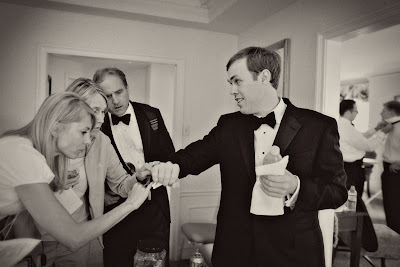 I also love it because my brother-in-law is tying my brother's bow tie for him in the background. There is nothing sweeter than seeing our families together like that. I still can't get over how handsome Jake looked that day. He should wear tuxedoes more often. Not everyone gives wedding gifts, I realize. A sweet note that morning could be just as sentimental. Jake and I love giving each other little gifts, so trying to find something that our future spouse would wear that day was exciting. Did you exchange gifts with your fiance before the wedding? Was the gift a surprise? My fiancee and I love giving each other gifts, too. He's also a cufflink wearer, and when I knew he was about to propose I bought him a great pair of cufflinks with "YES!" engraved on the back. I'm going to buy him another pair engraved with "I do" for our wedding, too. I took a photo of them here, although you can barely make out the inscription. Your rings are beautiful! I love the necklace inscription, too. Nicely done! i love the rings and the inscription on the necklace made me tear up. todd gave me a gorgeous bag and a couple of dresses for our honeymoon. this ring has made it to my ever-growing wish list. I love your e- ring, it's almost the same as mine. but what a great "something blue"
These gifts are awesome. The ring is beyond beautiful!! And the locket cufflinks with the special pictures could not be any more perfect. Since my hubby and I are young and paid for every thing on our own, we opted out of the gift giving. But we did both exchange cards…..the same card! :) I sent mine to him, and a bridesmaid came back with the same one – just a different touching message inside. We both thought that was really really neat that we had chosen the same card. Beautiful rings, and great gifts from both of you! My husband gave me a double stranded pearl bracelet on our wedding day. It completed my look perfectly, and I love seeing it in all our photos. oh how sweet! and what good taste, that ring is gorgeous! absolutey loved all the details that went into your gorgeous wedding! Jake bought the ring from Wabash Diamond Co. on Jeweler's Row. My engagement ring and our bands are from there, as well. I would definitely recommend them!